However, the voice of the Church today sounds like “one crying out in the wilderness” (John 1:23). Some may even ask, “Why does the Church keep silent, why do we not hear it?” The Church is not silent! But unfortunately, the Church’s voice is being drowned out among the cacophony of other voices calling not for peace, but for war; not for reconciliation, but for escalation of the violence; and not for efforts to save lives, but to continue their senseless and criminal destruction. A century ago, the First World War began. On 28 July 1914, Austria-Hungary declared war on Serbia, then on 1 August, Germany declared war on Russia, and over the course of a few short days, several more world powers joined the conflict either on their own initiative or by needs. Over the next three years, more and more countries joined both warring sides, dragged into the quicksand of fighting that was growing to encompass the European continent and far beyond it. The result of that four-year war was millions of lives lost–more than ten million soldiers dead and twelve million civilians. The war brought four great empires to ruin. And it had long-term effects for most of the countries involved: if there hadn’t been a First World War, there wouldn’t have been a Third Reich, or the Nazi party, or Hitler’s concentration camps and gas chambers. If Russia hadn’t been pulled into the First World War, there wouldn’t have been a Bolshevik revolution, famine, dekulakization, or mass repressions. The result of World War I was a repartitioning of the world, a redefining of spheres of influence. Yet many fundamental problems that the war attempted to solve remained unaddressed in its wake. And in twenty years’ time after the war, the same governments (only now with new rulers) found themselves drawn once again into an even more terrifying event, a conflict that came to be known as World War II. The First World War’s centennial anniversary is not likely to cause a major response around the world. Monuments will be opened in honor of the heroes, existing memorials will be cleaned up, and wreaths will be laid on soldiers’ graves. Solemn ceremonies will be held. But will the war’s anniversary serve as cause for serious reflection on the impact it had around the world? Will the impact of the two world wars become a lesson for those world leaders on whose shoulders it now rests to prevent a third? Today, a hundred years later, new world empires are at work repartitioning the world again, this time with the use of localized conflicts. The Middle East has been a powder keg for more than a decade–beginning with Iraq, the events of the “Arab Spring” have spilled over into Libya, Egypt, and Syria, drawing more and more countries into a not-yet-worldwide conflict. But the Middle East unrest has only in part been caused by domestic strife among the different peoples inhabiting the region: to a significant extent, the conflict has spread and continues to do so as a result of intervention from without. The war in Syria is hardly a civil one: third-party countries are fighting on its territory, each of which brings to the table its own specific interests. And likewise, current events in Iraq–the capture of major cities by radical Muslims–are not merely a consequence of civil uprisings. All this has become possible because ten years ago, outside forces decided to meddle in the situation and establish order. The current-day situation is beginning to resemble more and more the one brewing just before World War I. It is true that conflicts for the time being are localized in nature, but entire governments are being drawn into the militaristic rhetoric, and entire military-political groups. The polarization of opinions on the matter has reached a critical level. Various countries’ mass media are creating and supporting the image of the Enemy and demonizing the actions of foreign countries. It is a short step from this sort of behavior to a declaration of war on an international scale. Judging from these developments, it might seem that the lessons of World War I have been wholly and long ago forgotten, just like the lessons of the war that followed it, the human losses of which outweighed even the horrific figures of the first war several times over. The key lesson from both world wars is that in such wars, there can be no winner. All sides suffer massive losses, and everyone loses. Even today, historians continue to dispute who really won World War I. Strictly speaking, Germany, along with its Axis partners, lost the war. Having said that, can one really make a case for saying that Russia won? Only at the very outset of the war, in 1914, did things seem to be going well for Russia. The following three years, however, took a massive toll on the life and material well-being of the country and thoroughly exhausted Russia to the point that the Tsarist Empire fell, and the Bolsheviks, aided by Germany, were able to take over the country with almost no resistance. They couldn’t have achieved this had the great and powerful Russian Empire not been drawn into a bloody and atrocious war, the ramifications of which no one could have anticipated. Today, as well, no one wants to stop and consider such unforeseeable and terrible events that any such war would inevitably bring with it, directly or indirectly–a huge death toll for the civilian population. Nor do they want to think about the possibility that a bomb dropped on a military target may indeed destroy civilian housing, snuffing out the lives of the elderly, women, and children. Or about the likelihood that a rocket targeting a military aircraft might indeed destroy a commercial plane as has apparently happened with the Malaysian Airlines plane that crashed in the area where war is raging in southeastern Ukraine. No one has taken responsibility for that loss of 298 lives–none of whom had any relation to the war–and it appears highly unlikely that we will ever learn the names of the guilty parties to this atrocity. Nonetheless, the warring opponents in the dispute are already using this terrorist act to blame one another, making loud political statements and clamoring for punishment and retribution. That was the situation a century ago as well, when the outbreak of war was sparked by a Serbian terrorist’s assassination of the Austro-Hungarian heir to the throne. It was as though the world leaders were waiting for just such a shot to ring out so that they could begin the war that they all knew was inevitable. Notably, all of the countries entering the war expected a quick victory, a blitzkrieg with minimum losses and maximum gains. None of the world leaders at the time could possibly imagine the implications of their irresponsible decisions, which in the end would leave them awash in the blood of their own peoples. At the start of a war, it’s possible to more or less calculate the expected loss of life, but no one can count up the lives lost through foregone potential descendants of each soldier and each civilian killed, since each one takes to his grave at least one or two children, four grandchildren, eight great-grandchildren, and so on. 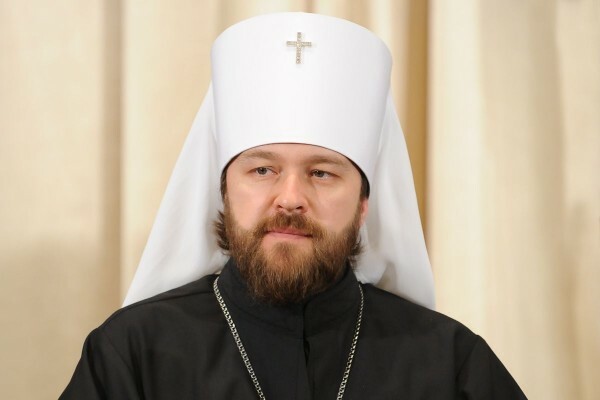 The Russian Orthodox Church has its own views on war, its own prophecies and its own warnings. The Church considers war to be an evil, and any killing a crime. However, it blesses soldiers who are fulfilling their holy duty of protecting loved ones and rectifying injustices. The Church condemns those world leaders who drag their citizens into military operations; however, it does not view the victims of such actions as having died in vain: “Greater love has no one than this, that one lay down his life for his friends” (John 15:3). The Church believes that Christ’s words can refer to those soldiers fighting on the field of battle to protect their faith and Fatherland and laying down their lives. It celebrates their heroic deeds and prays that God will forgive them all their sins and that they will be remembered in God’s everlasting memory. The Church believes in the resurrection of the dead. On Holy Saturday, the day of remembrance of Christ’s death and burial, the prophecy of Ezekiel is read in services, concerning a field full of bones of the dead. According to the words of the prophet, these bones are rejoined one to another, clothed with sinews and flesh, God breathes life into them, and they are transformed into living hosts. All those who have died on the battlefield or in other circumstances, all innocent victims of armed conflicts, are not lost forever: they will be resurrected into new bodies and a new life. While the Church strives to instill hope in people, it at the same time cautions them against actions that may deprive them of eternal life and the Kingdom of Heaven. The Church directs its voice to earthly authorities, warning them against being drawn into military conflicts that may take the lives of soldiers and civilians. The Church goes to great lengths to organize talks between hostile parties, to assist the wounded and suffering, and to oppose bellicose propaganda and outbursts of hatred that may provoke fratricidal clashes. The Church does not take sides in a civil war. When civil unrest began in Ukraine last winter, the canonical Ukrainian Orthodox Church, to which the majority of the population belongs, did not support either side. The Church’s members have ended up on both sides of the fence. The Church has called for a peaceful solution to all the accumulated problems and has acted as a mediator between the warring parties: monks from the Kiev-Pechersk Monastery took to Independence Square in Kiev and for many days stood in the pouring rain as a living shield, to prevent the two sides from clashing in mortal combat. The Church sees its mission as one of reconciling enemies, preventing violence, and protecting people’s lives. Today, when fratricidal war has engulfed the eastern regions of Ukraine, millions of believers of the multinational Russian Orthodox Church offer their fervent prayers for a speedy end to the civil war, and that peace will return to the blessed Ukrainian land. The Church also perpetually directs its voice to those in power, beseeching them to cease from hostilities and begin peace talks. The voice of the Church is the voice of God. Those who choose not to listen to that voice defy not only fundamental human values and common sense–they defy God Himself. But “God is not mocked; for whatever a man sows, this he will also reap” (Galatians 6:7). Having sown hatred and enmity, the leaders of the major world powers that entered World War I reaped death and destruction. May the events of a hundred years past serve as a sobering reminder to all those today who call for yet another repartitioning of the world, and who would attempt to resolve their international and domestic problems through military means.